Diagnosed with type 1 diabetes at the age of 14, Dana Lewis got used to hassle: using a portable glucose monitor to measure her blood sugar levels, and then calculating with a second device whether and when to inject herself with the insulin that she also carried. She set alarms overnight lest her blood sugar drop fatally low. In 2013, dissatisfied with the lack of innovation by conventional medical-device firms, she created an artificial, do-it-yourself pancreas system that administers the right amount of insulin automatically. Later, she decided to make the technology available to all those with the illness who were willing to build their own system. The resulting Internet community now has 400 ‘DIY diabetics’ who share readings online and collaboratively improve the device over time. This example illustrates, as Geoff Mulgan writes in Big Mind, that in the Internet era it is an anachronism to assume that “intelligence resides primarily in the space inside the human skull”. Online, large-scale group collaboration is encouraging the emergence of collective intelligence — the focus of Mulgan’s lucid and far-ranging book. After founding the think tank Demos, Mulgan served as director of the UK government’s Strategy Unit and head of policy under former prime minister Tony Blair. Today he leads the London-based innovation foundation Nesta. His central claim is that “every individual, organization or group could thrive more successfully if it tapped into…the brainpower of other people and machines”. Thankfully, Big Mind is not another breath-less recounting of the miracle of Wikipedia. Rather, Mulgan probes a subtler, conflicted reality: that groups of people and machines might not assemble in ways that lead to genuine advances in intelligence. For every artificial pancreas, there are many networks designed to sell advertising, accelerate the dissemination of cat pictures, spread fake news or turn online groups into online mobs. The benefit of connecting people is obvious when it comes to aggregating large quantities of distributed information quickly. For example, the Oxford English Dictionary was born of the collaboration of thousands of volunteers who submitted words and their etymologies to its editors in the nineteenth century. In the age of the Internet, such data-gathering successes have exploded, thanks to the use of crowdsourcing. In the early days of the Galaxy Zoo astronomy project, for example, hundreds of thousands of volunteers worldwide classified galaxies from images collected by the Sloan Digital Sky Survey, finishing in six months what would have taken years for a graduate student working around the clock. The charity Amnesty International runs a network engaging tens of thousands of volunteers from 150 countries to identify human-rights violations. However, such large-scale initiatives don’t necessarily help us to make important decisions such as formulating law or policy, organizing institutions or deciding between two complex or highly contested choices. So, despite our hyper-connectivity, we are not inevitably smarter, healthier or more just. Indeed, to avoid networked stupidity, we must focus on the structures, rules, skills, tools and standards that, as Mulgan writes, “turn fragmented, conflicting groups into something closer to a collective intelligence”. Organizing these components is the role of public institutions, Mulgan avers. The process of doing so is one that Lee Rainie and Barry Wellman describe in their book Networked (MIT, 2012) as the “choreography and exertion” necessary to manage online collaboration. Mulgan offers some ideas for how we could use collective intelligence — small and large scale — to unleash the better angels of our nature. On the global level, there is no more fitting example than the Internet’s impact on our ability to organize collective knowledge. On the local level, there is Reykjavik’s success in using new technology to extend the reach of its municipal lawmaking institutions by enabling citizens to suggest, and vote on, initiatives. Surprisingly, Mulgan devotes an optimistic chapter to ways of improving how we run meetings. He calls for smaller meetings that promote a shared understanding of their purpose through clearer agendas, allocation of defined tasks, well-stated goals, and better use of space, moderation and gadgets. Equally surprising is his ultimately dour and dispiriting assessment of the limits of collective intelligence for improving parliaments and legislatures at scale. He overestimates the success of new platforms for generating ideas, which, over time, have not led to much in the way of outcomes and have only increased frustration with democratic institutions. At the same time, he potentially underestimates emerging models for “crowdlaw” — that is, those online processes for engaging broader publics in making decisions and evaluating their impact. Mulgan points to examples of complex and large-scale political collaborations, such as the Paris Climate Accord and the 2015 ratification, by 193 countries, of the 17 global Sustainable Development Goals. And he rightly concludes that the jury is still out on the question of which processes or technologies could sustain new forms of collective public governing. Inspired by this question, the fifth annual Collective Intelligence Conference, held in June in New York City, focused on democracy. Experts from computer science to the social sciences came together to examine what democratic institutions need to do to better tap the intelligence and expertise of those they govern. As Mulgan concludes, answering this question is hampered by a stark fact. Although parliaments fund and universities conduct research, neither invest much in ways to improve how institutions actually mobilize collective intelligence. Despite the advent of the Internet, these bodies look the same as they did a generation ago. 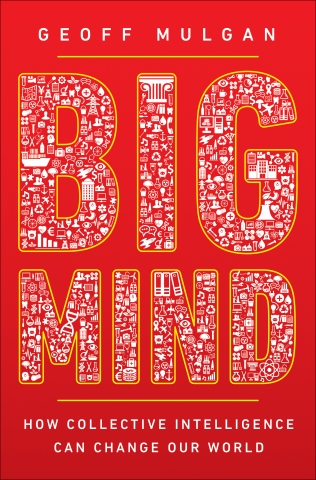 The trenchant questions and thoughtful discussion in Big Mind, however, will help us to reimagine our institutions and convince us of the urgency of doing so.